One of the things that make Halloween so much fun includes the pumpkin carving that people of all ages engage in. Children try their best to outdo each other while the adults try new ideas to make their jack-o-lanterns look scarier and with more details. However, the kind of tools that each uses determines whether they emerge at the top or become the laughing stock of the group. 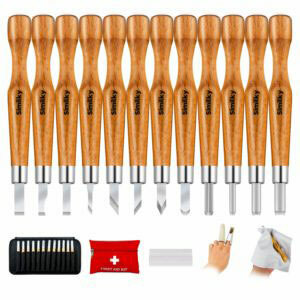 For the beginners and children that feel they have untapped skills in wood art or any other carving, it may be the ideal toolset. This might be the top wood carving tools for your kids. In more ways than one, the Similk toolset demonstrates again and again that it is ideal for the novices. But what is this that it has and others don’t? Well, the tools are quite user-friendly, with all the nice features you can expect from a top of the range tools. For example, the tools are safe, and you can leave them with your older children as they curve out various objects that come to their mind – no need to inhibit their budding hobby. As a novice woodcarver, it is important to have the right tools that prove not only comfortable to use but also sharp and durable; you get this from the Similk set. It does not matter how long it is going to take to develop the necessary skills; the toolset will stick around longer, offering the essential service during the growth process. It features the SK7 carbon steel blade to withstand the abuse characteristic of novice skills, and thus help in growth process towards becoming a pro. To put it into perspective, carbon steel is more robust than stainless steel and other common cheap metals. Furthermore, the high-quality blade has an electrolytic coating to make the carving process smooth and effortless. The blade is not only durable but sharp as well. 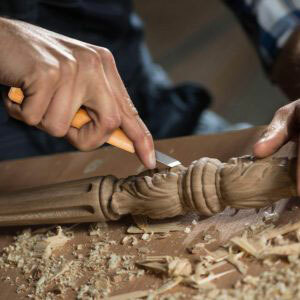 It makes woodcarving an easy task, and you get the desired results. Dull tools inhibit efficiency and thus creativity. It is quite hard to imagine something, and attempt to carve it out with a flat tool. It is demotivating, as well as unsafe. The set also comes with a protective cover to safeguard the blade from moisture and other small dirt that may negatively affect it. You see, carbon steel is vulnerable to rusting and corrosion, and the covers are useful in that aspect. The cover also protects you from scratches and injuries. And to increase portability, the tools come with a nylon case. That means you can carry the tools on your camping trip or other outdoors easily. The tools also come with ergonomic wood handles that make it easier for you to use. Getting blisters and different types of injuries will be a thing of the past. The carbon steel blade may not hold its edge for longer, and which may prove an accident risk. See, you exert more force to chuck a bit of material, and any slip can cause deep cuts in parts of your body. Ideally, always keep your carving tools sharpened and oiled for efficiency. You will also find protective covers, as well as a portable nylon case that accompanies it. These help keep you safe from injuries and other associated mishaps. The ergonomic handles enhance hand safety during usage. While SK7 carbon steel demonstrates a high-level ruggedness to last a good number of carving years, it requires frequent maintenance. You will need always to do some oiling and sharpening to keep them performing at are a reasonable level. The tools are also not for carving hardwood or other hard templates. Therefore, you will need other pro tools as your skills improve. Some of us are fast learners and will take to carving like fish in water. That means you will need to look for other better tools, sooner than anticipated, which may seem like a waste of resources. What separates Similk toolset from most other tools is its durability, ease of use and sharp edges. The toolset is affordable, and you will not need to use a significant amount of savings. They are lightweight which also makes woodcarving easier and fun – the learning process will be as fun as it can get. The product comes with full money back guarantee to safeguard you from defects and other unsatisfactory quality issues. You may also get free shipping with this product – so much better.